When I was first learning to make pysanky, back in the 1960s and 70s, I would often buy pysanka design postcards. These were just about the only color pictures of pysanky that I could find at that time. Most books and pattern sheets of that era were in black and white, with perhaps a color plate on the cover. The cards were often sold at pysanka presentations and classes, and the Ukrainian shops carried them as well. I bought as many as I could find, but my collecting was erratic, and not all my sets are complete. They were well used, as the wax marks and scratches on them will attest. The earliest sets were produced by Surma in the late sixties; the Ukrainian Gift Shop produced several series a bit later, in the seventies. These early sets were fairly straightforward–six eggs on a colored background. The Surma cards had a solid background, while the UGS ones had white or textured backgrounds. Years passed, and the cards became more elaborate–more interesting and artistic groupings, shadowing, reflections, greater detail and bits of embroidery became common. I collected these, too. I glued all my cards into a photo album, and used it as a pattern source. Some of the cards I cut up to make them more interesting, or to fit a few more on a page without extraneous distractions. Most are well glued, and I have no idea of who made them or when. On a few the glue is a bit weaker, or the patterns familiar, so I can guess their source. I am not sure what the purpose of these cards was. I and other pysankarky used them as a pattern source; other people may have mailed them out, especially the later, more decorative ones, as Easter cards. Still, they are rarely found anymore. Surma still has cards from two series (II and IV) still offered in their catalog; UGS no longer sells them (at least not in the on-line store). Those in the last album were souvenir post cards from the Museum of the Pysanka in Kolomyia, and meant to be mailed. That is why I have posted them here to share. The detail may not be as good as in the original cards, but it’s better than nothing. If you can find any, I strongly encourage you to purchase them. 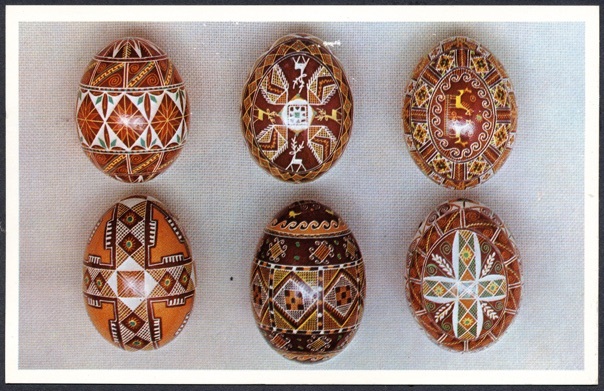 Much of the identifying information, when present, is from the ArtUkraine site, which has two galleries of postcards, both Easter themed and pysanka themed. Card collectors might be interested in these pages (and these) on the ArtUkraine site. Back to MAIN Ukrainian Easter home page.